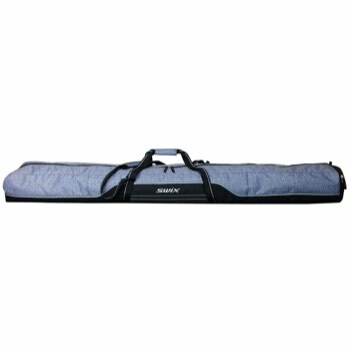 Make it easy to carry skis to and from the mountain with this durable double ski bag from Swix. 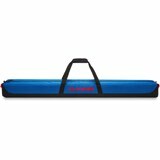 The Swix Road Trip Expandable Double Ski Bag is made from durable polyester fabric with PVC backing and features a two-tone design with contrast accent piping, a Swix logo on the side, and smooth tarpaulin panels at the ends for added protection. 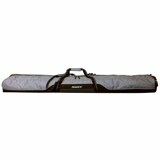 This ski bag has a full length zipper closure with a fully padded interior that offers storage for two pairs of skis. 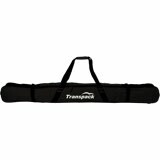 With an extendable design that accommodates skis between 170cm and 190cm, this bag features extra padding on the outside to protect the binding section, top handles for easy lifting, and a shoulder strap that makes it comfortable to carry. 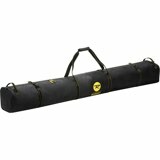 Double ski bag that will hold two pair of skis and protected by padded sleeve inside. Fully padded through binding section, this bag will extend to 170cm-190cm. Extra padding on outside to further protect the binding section. Smooth tarpaulin panels at ends to protect equipment. Dimensions: 10" x 13" x 72"